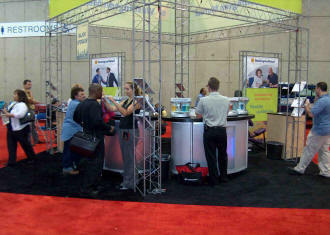 Using Oxygen party bars in trade show exhibitor booths. If you are planning on hosting a booth at a trade show, and you want to have the most effective marketing plan at the trade show. Consider putting on oxygen party bar in your booth. When potential customers walk by your booth, you have about 30 seconds to attract their attention or they are gone forever. With an oxygen party bar, people are exhausted from walking the show and they stop for an oxygen session to regenerate their tired feet. While at the oxygen party bar they are connected to the oxygen line and are basically tied to your booth for 5 or 10 minutes. At Oxygen Party Bar, we service a lot of trade shows and we train our girls to spend 30 seconds connecting the customer to the oxygen line and how to change the valves to sample different aromas. The also tell the customer to plan on spending 5 or 10 minutes to get maximum benefit. This programs the guest and then they intentionally go quiet and allow the booth sales people control the conversation. The customer begins feeling relaxes and is open to any suggestions or ideas the sales person present. Studies have shown that the increased traffic to the booth increases sales and product awareness. This easily justifies the cost of the oxygen party bar rental. The oxygen dispensers can be setup to display the company logo or product line they are marketing. Also we print labels that are attached to the cannulas that promote the product line or company name. Most people stick their cannula in their catalog bag and review it again when they have returned home. When a trade show exhibitor sets up a booth, they try to attract as much attention as possible to their booth. All the exhibitors are competing for traffic. Some put "Wheels of Fortune" or other gimmicks and spend all their time running the game, and don't spend much time selling or networking with potential customers. With an Oxygen Party Bar, our girl runs the bar and the exhibitor spends 100% of his time networking with potential customers. Obviously you can tell we have a lot of trade show experience and we are available to help promote your product line. An oxygen party bar rental usually includes setup of the equipment, staff to operate the bar, technical support, liability insurance, and removal of the equipment immediately following the trade show. You don't have to lift a finger. All we need is a dedicated 110 volt electrical plug within 10 feet. Usually the electrical people can place it under the bar so no one can see or trip on the line. We have also seen exhibitors place a large screen plasma screen on the wall behind the oxygen party bar that runs a video promoting the company and their product lines. People walking by can view the video and those sitting at the oxygen bar can view the video while the sales people are talking to other customers.